Saving Christmas is what every child wants to hear or read. Sam and his friends receive a visit from Jingle, Santa Claus’ elf who tells them that a train with all of the children’s letters to Santa has been left behind at the station. Jingle wants Sam and his friends to help save Christmas. The group hook up the little train and fly to the North Pole where they deliver the children’s letters to Santa. Sam Sam is a four year old boy whose imagination sees his cubby friends, Marzipan (his faithful cat – who also talks); Spoon, Dish and Tock (the cubby wall clock) come to life and join him on his adventures. This early learning book is superbly illustrated and children will want to read the story over and over, as they too will imagine sharing Sam Sam’s adventure. 5.0 out of 5 starsSam Sam to the Rescue! Jingle the Elf needs help. How is he going to get all of the letters to Santa to the North Pole? Sam Sam, Marzipan and the Cubby House friends race to the rescue. Will they make the delivery in time? This action packed story will please any preschooler. Brightly colored illustrations add to a young child's enjoyment of this holiday adventure to the North Pole. Enjoy! Kindle Unlimited, not sure of reading order except the cubby house is the first one and treasure chest is #5. ILLUSTRATED Should look in to seeing if my grandkids are too old for these, though heard that they are about to have #3 kid so that's a thought. Saving Christmas is what every child wants to hear or read. 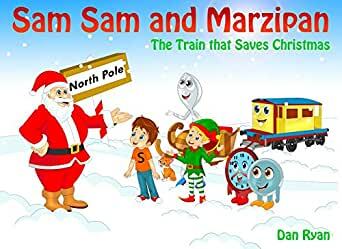 Sam and his friends receive a visit from Jingle, Santa Claus’ elf who tells them that a train with all of the children’s letters to Santa has been left behind at the station. Jingle wants Sam and his friends to help save Christmas. The group hook up the little train and fly to the North Pole where they deliver the children’s letters to Santa. Sam Sam is a four year old boy whose imagination sees his cubby friends, Marzipan (his faithful cat – who also talks); Spoon, Dish and Tock (the cubby wall clock) come to life and join him on his adventures.